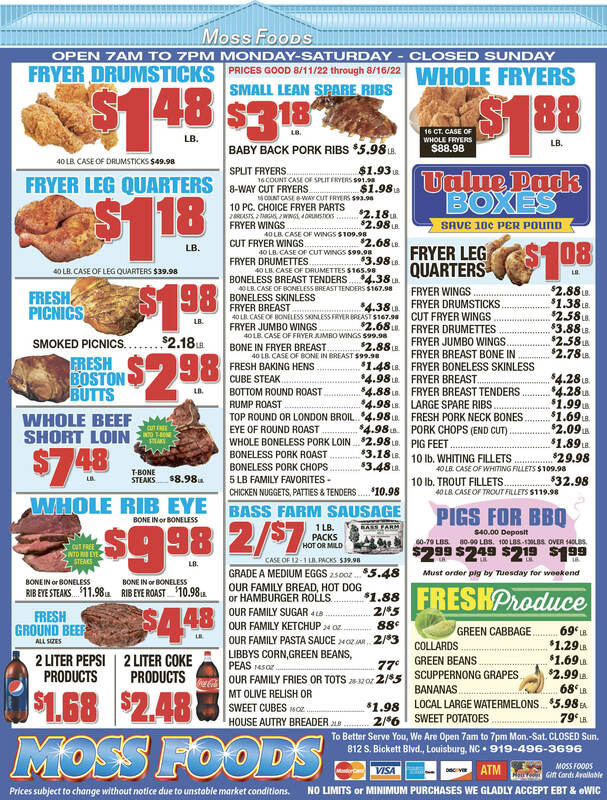 Showing 40 articles from June 3, 2015. LOUISBURG -- Franklin County's budget proposal increases school system spending by half a million dollars over last year. But, during a budget session Monday afternoon, school officials and staff told commissioners they would need more if they are going to maintain buildings, recruit and retain teachers and improve test scores. "We are doing what needs to be done to move forward from having good schools to having great schools," Superintendent Lisa Martin told both boards during the budget session, noting more funding is needed to continue that path. 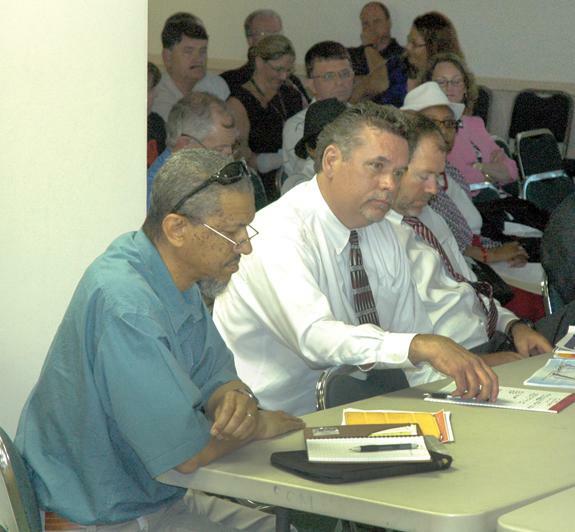 LOUISBURG -- For about two hours, residents offered commissioners solutions to their budget crisis, from cutting the assistant county manager's position, to selling the airport, to getting rid of the economic development department to halting plans to develop Owens Park. Franklin County commissioners listened to all of those comments during a public hearing on their 2015-16 proposed budget that would raise the county's tax rate from 87.25 cents per $100 of valuation to 99.25 cents per $100 of valuation. 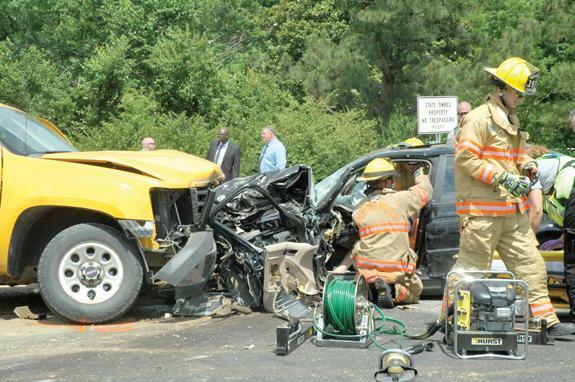 YOUNGSVILLE -- Charges are pending against a Knightdale man who led Wake County authorities on a high-speed chase that ended with a head-on collision east of Youngsville. No fatalities were reported. According to authorities, Wake County deputies were checking on Chandler Womble after family members were concerned about his well being at about 2 p.m. on June 1. FRANKLINTON -- Commissioners took a hatchet to the town's budget this week, taking a spending plan that had proposed as much as an 11-cent tax increase down to one that calls for just three cents, or perhaps no increase at all. It will come at the expense, though, of reduced services like brush pickup, cemetery grass cutting, pothole patching and building and grounds maintenance, and customer service at town hall and in the police department. CONGRATS. 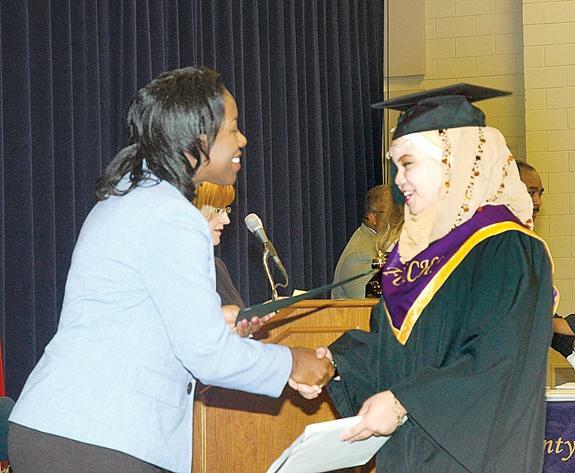 Vance-Granville Community College President Stelfanie Williams, congratulates Natasha Bonthron upon graduation. HENDERSON -- A few years ago, the Franklin County school system began its Early College High School -- a program that lets students earn their high school diploma and two years of college study in a five-year window. The rigors, said graduate Imani Burwell, can have students seeing double. "You have to balance college, high school, a social life ... volunteering," she told fellow graduates, family and friends during the 2015 graduating class ceremony at the Vance-Granville Community College Civic Center on May 28. Quick, call 911 and have an ambulance on standby. I'm about to (partially) agree with the chairman of the Franklin County commissioners and we don't want Chairman Sidney Dunston to faint and fall over! The chairman said recently that people should come to budget meetings with something more concrete than the simplistic "no more taxes" plea we've been hearing. 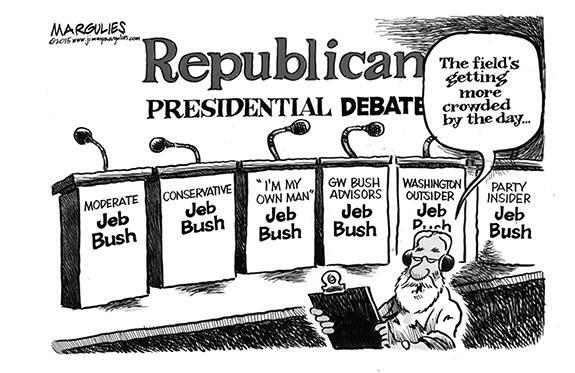 Politics: The art of saying exactly the same thing in two situations and meaning exactly the opposite in each. 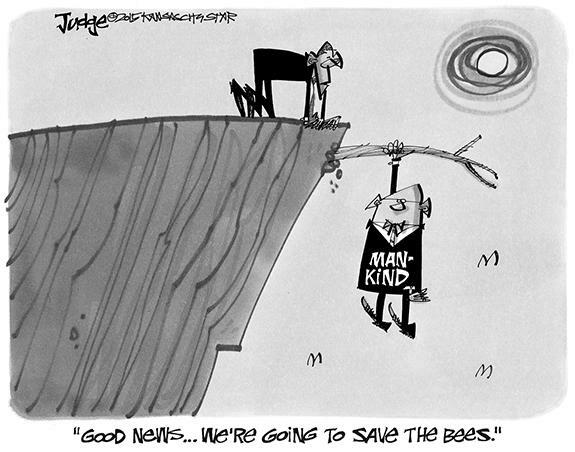 It may be infuriating to many of us, but it's pretty much situation normal in our state's politics these days. Consider the supposed effort by state government to improve economic growth and create jobs in our state, something every politcian since at least Noah has professed to be doing. There is really no such thing as a free lunch. For a Colorado woman, it cost her job as kitchen manager at an elementary school. According to reports, Della Curry was fired because she gave away meals to students who didn't have money for lunch. She is not sorry, and probably shouldn't be. 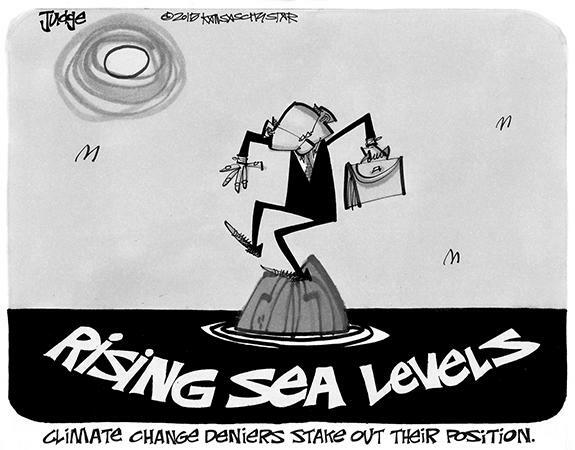 Agreeing with the governor: Is that a cause for worry? Last week Gov. Pat McCrory took actions I liked on two consecutive days. Color me cynical, but that concerned me. On Thursday, he vetoed SB2, the Magistrates Recusal for Civil Ceremonies Bill. I like to call it the Selective Service Bill. For my older readers, that has nothing to do with the military draft and everything to do with anarchy. 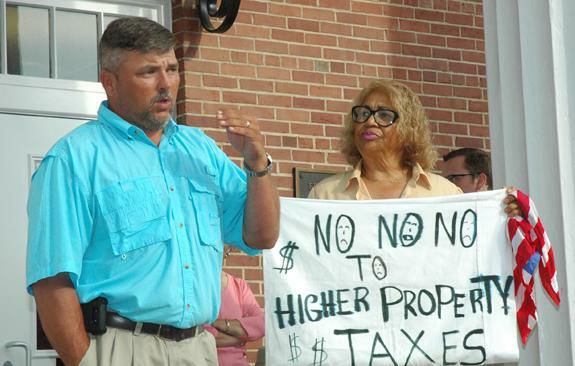 I read with interest, and confusion, the letter from the lady from Youngsville who protested the possibility of a substantial property tax increase in Franklin County. WARRENTON-Funeral services for Almetra Perry Sumler, 89, who died Monday, June 1, 2015, will be held at 12 p.m. on Saturday, June 6, at Ambassadors For Christ Ministries in Louisburg, with Bishop Nathan Perry officiating. Burial will follow in the Mt. Zion AFC Church cemetery. HENDERSON - Funeral services for Geraldine Stroman, 79, who died Friday, May 29, 2015, will be held at 11 a.m. Saturday, June 6, at Dickies Grove Baptist Church, Henderson. Burial will follow in the church cemetery. LOUISBURG - Funeral services for Lillie Marie Harris, 87, who died Thursday, May 28, 2015, will be held at 3 p.m. Saturday, June 6, at Richardson Funeral Home chapel in Louisburg. Burial will follow in the M. H. Jones cemetery. CLOSE CALL. Bunn High School's Jessica Szkola (right) avoids a pickoff attempt at first base during last Thursday evening's loss to South Granville in the semifinals of the Class 2-A State Softball Playoffs in Creedmoor. 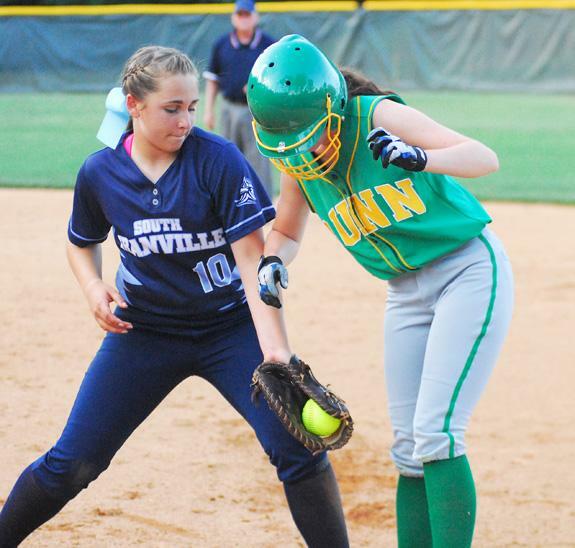 CREEDMOOR -- Two regular season victories over South Granville helped propel the Bunn Ladycats to the Northern Carolina Conference championship -- but amounted to nothing in the semifinals of the Class 2-A State Softball Playoffs. Given their success over SG in the early meetings, the Ladycats had to be considered a favorite to take the best-of-three series -- especially since Bunn hadn't allowed a run through four postseason wins heading into the semis, which constituted the Eastern Regional Finals. THE TOP CATS. 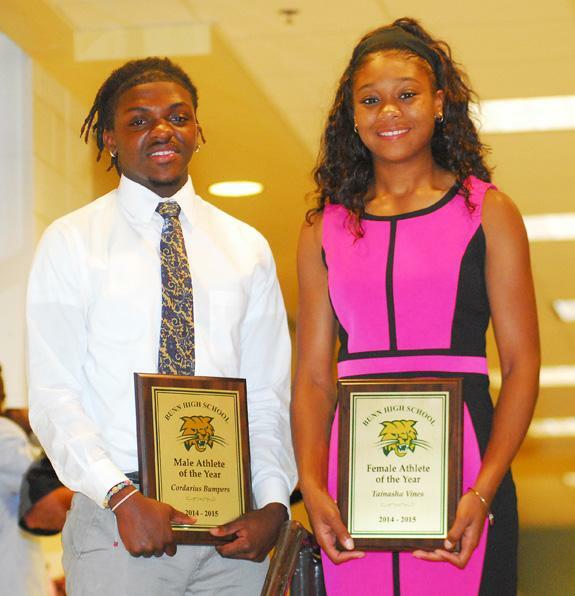 (L to R) Cordarius Bumpers and Tainasha Vines have been honored as the Bunn High School Athletes of the Year. BUNN - One of the greatest formalities in recent Bunn High School history came last Wednesday when BHS Principal Robin Faulkner stepped to the podium to announce the Wildcats' Female Athlete of the Year for the 2014-15 season. Even Faulkner admitted the moment was a bit anticlimactic before she predictably announced senior Tainasha Vines as the recipient at the annual Bunn Athletic Awards Ceremony. THE FUN HAS JUST STARTED. Ricky Person has three years remaining in his football career at Franklinton High School. FRANKLINTON -- Ricky Person hasn't even kicked off his sophomore season at Franklinton High School -- but he has already attracted the attention of a slew of high-level college football programs. 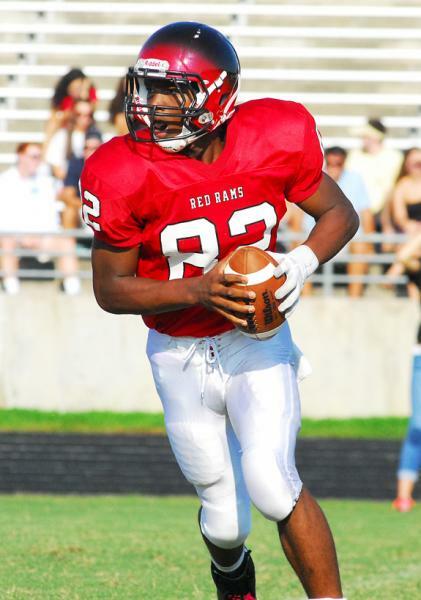 Person, a running back, has already received a scholarship offer from UNC-Charlotte. He will attend a camp this Saturday at Duke University and has more summer camps scheduled at the likes of North Carolina State, UNC-Chapel Hill, Georgia and Florida State. 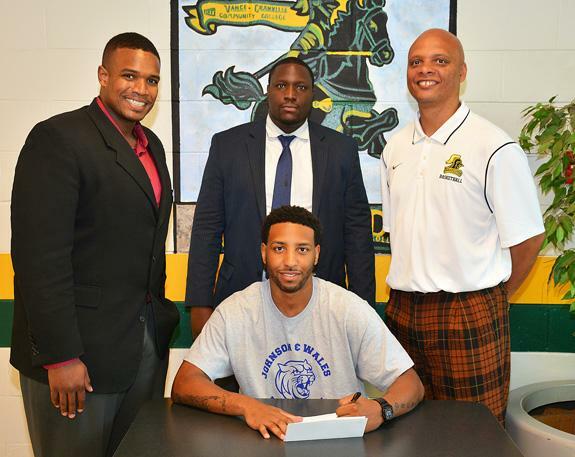 HENDERSON -- Two sophomores from the Vance-Granville Community College Vanguards men's basketball team have signed letters of intent to play at the next level with Johnson & Wales University in Charlotte. Guard Jarrett Ballard of Durham and forward Rodney Kirby of Burlington are transferring to the four-year school that is considered a rising program within the United States Collegiate Athletic Association. 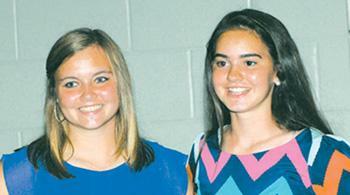 LOUISBURG -- Louisburg High School has released a full list of winners from the annual LHS Athletic Awards Ceremony. ZEBULON -- Jacob Schrader was 3-for-5 with a three run home run and Britt Robertshaw and Matt Marksberry combined to pitch six scoreless relief innings, but the homestanding Carolina Mudcats dropped the finale of a five-game series with the visiting Blue Rocks 6-5 on Tuesday night at Five County Stadium. Luis Rico started for the Blue Rocks (29-23), but left the game after the fourth. He gave up three runs on seven hits and did not earn a decision. BUNN -- The 25th Annual Bunn Wildcats Football Camp will be held June 22-25 on the BHS campus. Bunn grid coach David Howle will oversee the event along with BHS assistant coaches and players. Cost is $75 per person, which includes a T-shirt. The camp will run from 9 a.m.-Noon. The event is open to rising second through ninth-grade students. 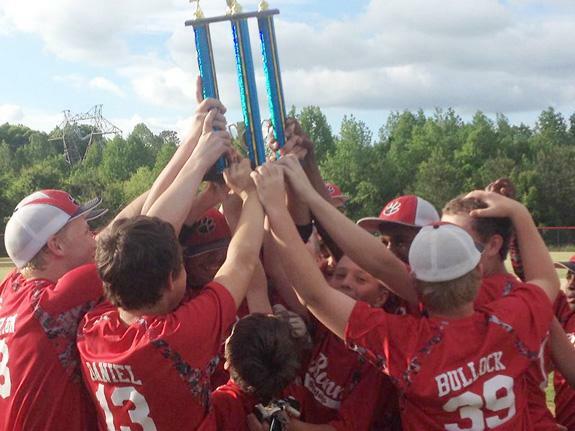 BUNN -- Bunn Middle School has fielded its share of dominant baseball squads through the years -- but this season's group may go down as the Bulldogs' finest. Certainly, the statistics tell the story of the Bulldogs surge to the Middle Athletic Conference regular season and tournament championships. BUNN -- Undeniably, the Bunn Middle School baseball team had an incredible season. The team went 9-0 in regular season and won the end-of-season Middle Athletic Conference Tournament for a final record of 12-0. Early in the campaign, Coach Robert Pendleton announced this would be his last year at Bunn Middle School, and his players made it their goal to win the conference for their coach. TRULY A JOB WELL DONE. Members of the Franklinton High School Winter Guard pose after taking first place at an event at Western Harnett HS near Lillington in March. 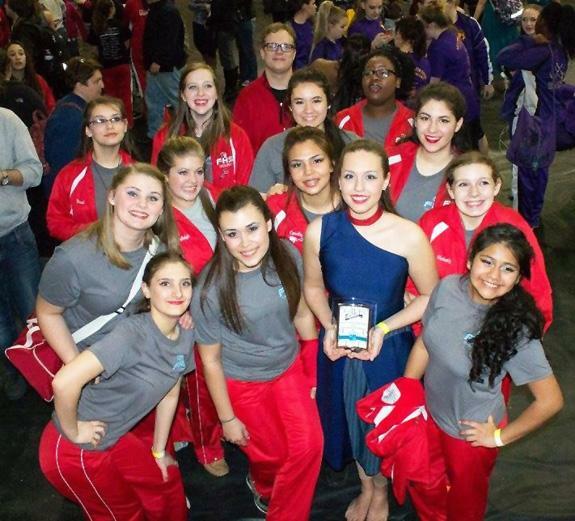 FRANKLINTON -- Despite adverse weather that cut into practice and camp time, the Franklinton High School Winter Guard enjoyed another strong season in 2014-15. Under the instruction of Scott and Nikki Booth, the Guard performed under the theme 'Artists in Paris' and took part in five competitions. REASON TO CELEBRATE. Franklin County resident Chad Tyler is joined by his family after winning the MMA Fight Night Championship recently in Charlottesville, Virginia. CHARLOTTESVILLE, VA. -- From the beginning of the bout there was an obvious difference in the two fighters during a Fight Night Challenge Heavyweight Championship event on April 25 in Virginia. John Calloway (The Current F.N.C. SHW Champion), was known to be a big-time striker. Franklin County resident Chad Tyler is a classic grappler with a background in BJJ, Sambo, and Wrestling. LOUISBURG -- Louisburg College will host the 2015 Canes Summer Softball Camp from June 15-17 at Sheilah R. Cotten Field on the LC campus. The three-day camp will encompass the entire sport of softball. LC head coach Hope Creasy will oversee the event. Cost is $225 per camper, which includes T-shirt and lunch. 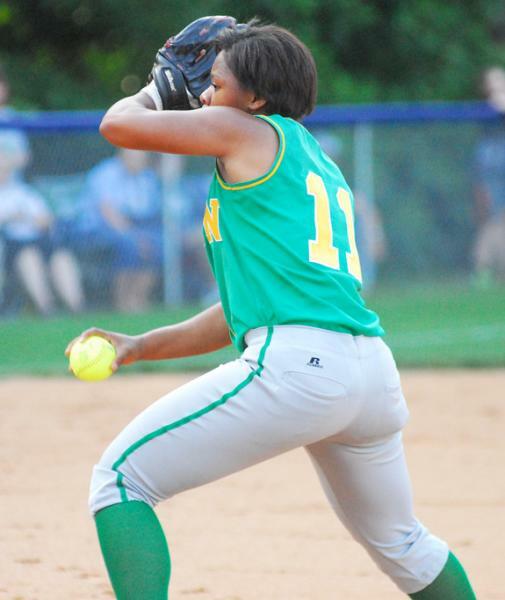 Bunn's Erica Davis was spectacular on the mound this season for the Ladycats. 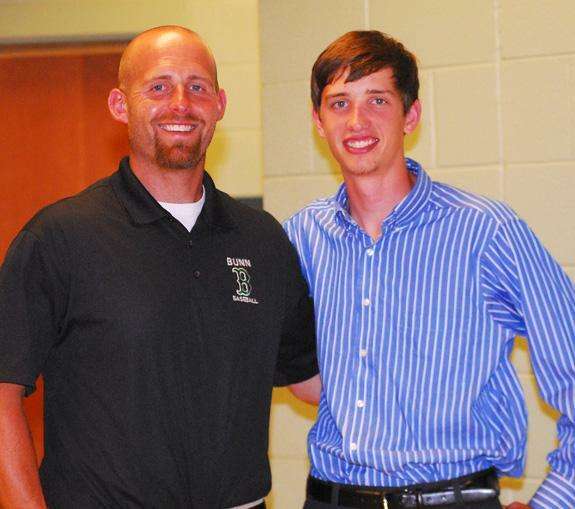 (L to R) Coach Chris Cullom and pitcher/infielder Thomas Dean helped the Bunn Wildcats nab a share of the Northern Carolina Conference baseball championship. LOUISBURG -- Louisburg College has announced the Honors List for Spring 2015. To be named to the Honors List, a student must have completed at least 12 or more hours of college credit in a given semester and have a semester grade point average between 3.0 and 3.49. LOUISBURG -- One of the largest recent graduating classes at Louisburg College, including eight Franklin County residents, celebrated commencement last month. They were among the 138 graduates honored at the Louisburg College Commencement Ceremony. RALEIGH -- Hannah Styers, a sophomore at Franklinton High School, served as a page for the North Carolina Senate recently. Hannah was sponsored by Sen. Chad Barefoot (R-Wake). CenturyLink has awarded 19 Teachers and Technology Grants - a program that provides funding for unique and innovative projects in the classroom. Three awards were received by teachers in Franklin County Schools, and totaled more than $11,500. Safe Space Inc. held its 13th annual reverse raffle fundraiser recently at Louisburg United Methodist Church. Guests purchased $100 tickets, admitting two people and enjoyed a prime rib dinner. 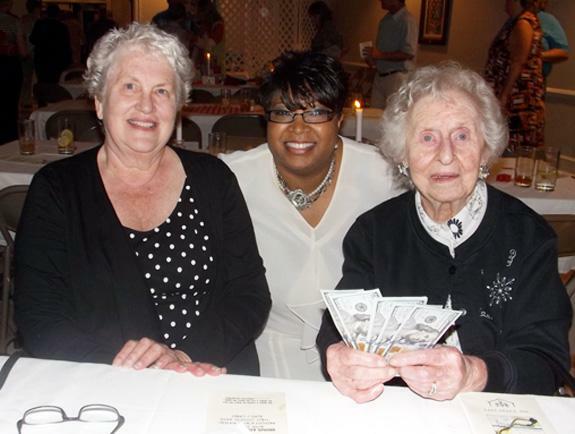 Lavern Neff (right) was the lucky winner of the grand prize of $1,000. Neff's daughter, Judy Bozikis, is shown at left along with Monica Kearney, executive director of Safe Space. Franklin County and Vicinity Ministers Wives and Ministers Widows recently hosted the 65th annual session of the Ministers Wives and Ministers Widows Interdenominational in Raleigh. Franklin County native Ellender LeMay is state president and Annette Hall is local president. The theme was "Embracing God's Transforming Power in the Lives of Ministers Wives and Ministers Widows: Raising the Standard of Excellence Through Faith, Prayer and Love" from Romans 12:1-2. Sixth grade Essay winners, l-r, Stevie Huss, Justin Jackson, Logan Dickerson, Raegan Kuusinen and Justice Rizzo. Thursday, April 30, 2015 will be remembered as an extremely special night for 44 of Franklin County's best young artists, journalists and conservationists! 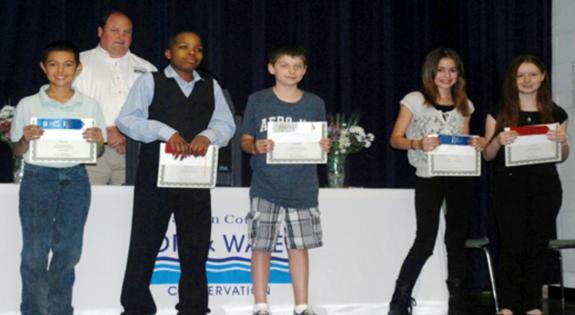 Each of these skilled students submitted contributions in the 2014-2015 Franklin Soil & Water Conservation District Poster, Essay & Computer Designed Slide Show challenge. 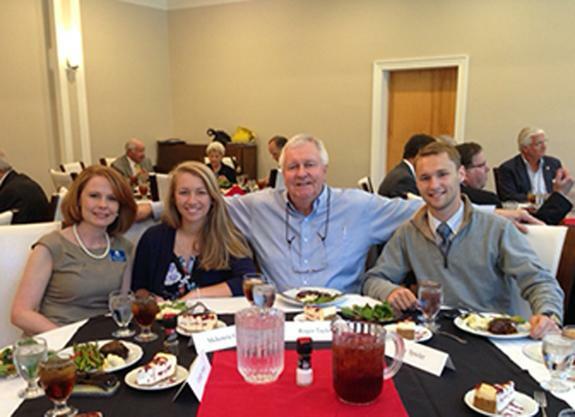 LOUISBURG -- The Louisburg College Honors Program celebrated its first graduating class with a $100,000 gift from Mr. and Mrs. Roger G. Taylor. The gift will allow the program to further its mission of encouraging, communicating and rewarding academic excellence and leadership. 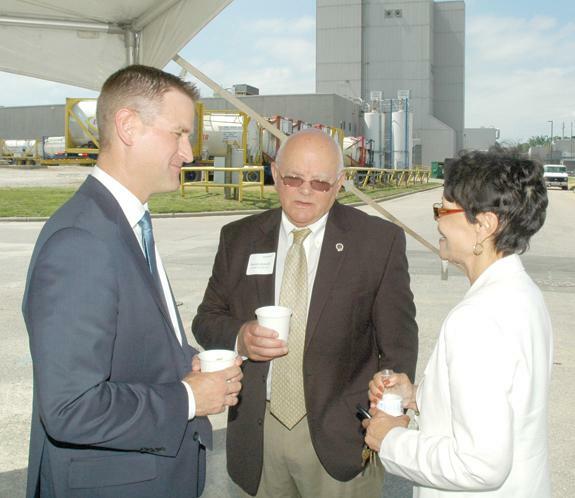 Novozymes President Adam Monroe (left) chats with EDC Director Ronnie Goswick and State Rep. Bobbie Richardson. FRANKLINTON -- Last week, Novozymes officials lit a flare that symbolized the start of a system that converts wastewater to methane -- providing a sustainable power source for the biotech company. "This represents a special investment for us," said Novozymes Executive Vice President Thomas Nagy. "It's part of our ambition to make the world a better place to live."